This page aint much to look at, but its definitely all here. 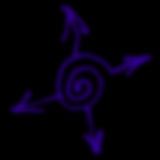 I was going to do it graphically in order to make it look a bit slicker, but then I figured theres really no point. This is as clear as it can be. Ive added notes, indicated by superscripted numbers, as well as links to manufacturers pages if available. As far as I can tell, this page has more info on Michaels rig than anyones ever put together, so please read all the notes if youre confused about something. For the insatiable, Ill grab his EQ and processor settings during the fall tour and post them here as well. Also see Michaels sound system requirements for the full picture. In 1994, Michael switched from regular flute to alto flute, as seen below in 95 (photo courtesy Ike Gauley). The Shure SM-15 Headset Condenser Mic has been discontinued. See Shure for current comparable models. Michael uses a total of four T. C. Electronics 1140sone for vocal/flute, one for his acoustic guitars FRAP pickup, one for his acoustic guitars Sunrise pickup, and one for his low-strung acoustic guitar. The combination of parametric EQ with the ability to get a 1/10th octave Q setting plus the built in preamp make the 1140s ideal for Michael. He recently tried other parametrics which can get even narrower Q settings, but according to his guitar/stage tech, Jill Anania, the lack of an integrated preamp in the models he tried threw his gain structure off and Michael didnt like the interfaces as much. This signal path refers to Michaels ever-present 1971 Martin D-28, nicknamed Barbara (since shes spent so much time in bars), with which he has always toured. Due to the combination of the Sunrise S-1 magnetic pickup and FRAP contact pickup under the treble strings (and Michael phenomenal ability to EQ), Barbara has a very distinctive, slightly throaty and brilliant tone. The basic idea is that the FRAP handles all the transients and woodiness while the Sunrise gives fatness and low end (he scoops the Sunrise EQ and particularly boosts around 64Hz). Barbara can be heard on most tracks from Aerial Boundaries, Watching My Life Go By (also pictured on cover), all of Live on the Double Planet, Ritual Dance, Dirge, Jitterboogie, and much more. Michael and Barbara in 94. FRAP stands for Flat Response Acoustic Pickup and was created by Arnie Lazarus. Similar pickups are also made by Trance Audio under the name Acoustic Lens, although the FRAP in Barbara and most of Michaels guitars are Lazarus originals. Barbaras FRAP is mounted under the bridge on the treble side and provides Michael with the crystal clear high end he is able to achieve live without a mic. Since the FRAP is a true 3-D transducer and is extremely sensitive, it also picks up all of Michaels thumps and slaps. To get an idea of how sensitive it is, listen to the shaking sound 53 seconds into the live version of Silent Anticipations. Its Michaels palm sliding over the soundboard before his pick makes contact with the strings. A voluntary plug by your webmaster here. I have two Trance Audio Acoustic Lenses in my acoustic as part of the Amulet System. When panned, they provide a beautiful stereo image and give all the brilliant highs and complexity you hear in Michaels sound (although I cant comment on the music itself or my ability to EQ it) as well as some huge lows. The Amulet rig is beyond awesome. Ive checked out a lot of other contact pickups and they dont even come close. They all sound like tin foil in comparison. And forget about saddle piezos because they all make your strings sound like rubber bands in comparison. One last thing. Personally, I recommend you do NOT install Acoustic Lenses yourself. They come with installation guidelines to enable you to do it yourself, but from what Michael has told me and what I experienced myself, the installation clearly involves a certain amount of voodoo. I attempted the installation myself and ended up shipping my guitar cross country to have Gary Hull at Trance redo it. Youve got to nail the sweet spot with these things and its easier and cheaper to let Gary do it. Since he reinstalled the Lenses, my guitar sounds so good I havent used a mic since. And no, Im not getting paid to say all this. Just tryin to save you some hassle. The T. C. Electronics 1210 Spatial Expander is the effect Michael is turning on and off from the stage and which provides his surround-sound. He is only using this effect on the low end of the spectrum via the Sunrise pickup. The high end via the FRAP is untouched. The combination results in a more subtle and musical effect. Or as Michael says, I want to make your heart swim, not swoosh your brain. The 1210 has 2 inputs. With the front panel switches in the proper positions, a signal introduced at the Ch. 1 input appears at the 1/4" Ch. 1 output as a stereo signal, with Right on the tip, Left on the ring, and Ground on the sleeve of the 1/4" TRS jack. The same is true for Ch. 2. This allows the 1210 to be used as two separate stereo chorus units, but cannot be done using the XLR outs, as there are only two, and youd need four to have L/R x2. It is important to note that both the T. C. Electronics 1210 Spatial Expander and T. C. Electronics SCF pedal have three processing modes, i.e., chorus, flange, and pitch modulation. Michael does not use these units in chorus mode, but rather in pitch modulation (PM) mode. PM mode provides a significantly wider image yet is more subtle and fluid. Having purchased an SCF pedal in late 96 myself, I noticed a subtle design flaw which T. C. Electronics has verified. In PM mode (but not in Chorus or Flange mode), newer SCFs produce an easily detected pop during switching. Consequently, using it as Michael does by frequently engaging and disengaging the effect during a tune proves distracting. Older model SCFs, while having slightly noisier processors, do not produce a pop during switching. Older model SCFs can be identified by a reddish/purple logo while newer models have a bluish/purple logo. 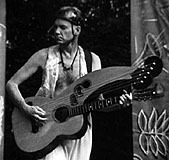 The first low-strung guitar Michael toured with was a custom Takamine (below left, photo by Jay Blakesberg) which they presented to him as a gift with his name on the headstock while on tour in Japan in the late 80s. His favorite, however, is a Lowden L-250 (below center), although he has occasionally toured with a Martin J-65M (below right). Michael goes through phases with his harp guitars. His first was a 1920s Dyer configured with a FRAP/autoharp pickup combo (below left). 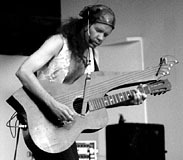 Next, he went to a Steve Klein electric harp guitar with a TransTrem bridge (heard on Point A and Point B). Then to a black Dyer with a FRAP/autoharp pickup comboand rattlesnake tail wedged under the sub-basses at headstock (essential for good earth tone!) (photo courtesy Alan Tignanelli). And finally, back to his first Dyer, but reconfigured with a Sunrise S-1 and two Barcus Berry magnetic pickups for the sub-basses which he glued straight to the body (photo courtesy Laurel Paulson-Pierce). Michael uses DAddario strings. NW = nickel wound, PL = plain, and S = Steinberger (double ball-ended). Michael does not use traditional bronze-wound acoustic guitar strings since they provide less signal output to his Sunrise magnetic pickup. If you have other questions about Michaels rig, please send them to webmaster@nomadland.com.